Vikings - We want you! Use the following video and links to find out some information about Viking Warriors. 2. The weapons and equipment they had. 3. Where they travelled to. 4. How often they would go on raids. Write a leaflet encouraging people to join up and become vikings. Include the information above. Wii in School this week. Its been a good week for the Wii in Nightingale this week. Its been used in both a Year 6 maths lessson and a Year 4 PE lesson. Click on the links to see what we did and how it worked out. Today was day two to Mario Kart in class. Click on the link to find out how it went. 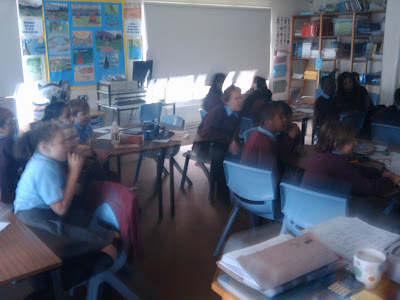 Mario Kart in Year 6 - Day 1. Today I started using my new Wii in class, which I got though the Redbridge Games Network. Click on the link to find out how it started out. Work done by primary NQTs. I Love Kirby Krackle - New Geek Music. Check out Back to the Beginning if you like Mario Kart. Ring Capacity if you love Green Lantern.